Playing bodyguard to a vigilante librarian–excuse me, library technician–is not the career move Tony DeMonte had in mind when he came to this town. 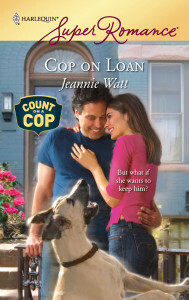 On temporary loan, the big-city cop figured he’d take it easy, maybe watch the grass grow. Not with Jasmine Storm colliding into danger every other day. Getting mixed up with a failed drug bust is just the beginning. Now she claims there’s an intruder in her house. Which leaves Tony no choice but to…move in. Jasmine and her cat get the protection they need, and Tony and his dog get a roof over their heads. But he can’t stay forever–despite one attractive library technician’s attempts to make him see that a solitary life is a lonely life…. RT Book Reviews: 4 stars …Jeannie Watt’sCop on Loan (4) is an intriguing mystery with two characters who have a great chemistry. Anthony works well as a flawed hero.